Ruff Sawn Schlabach Timbers- Muskoka Series Bedroom. All Solid Wormy Maple. 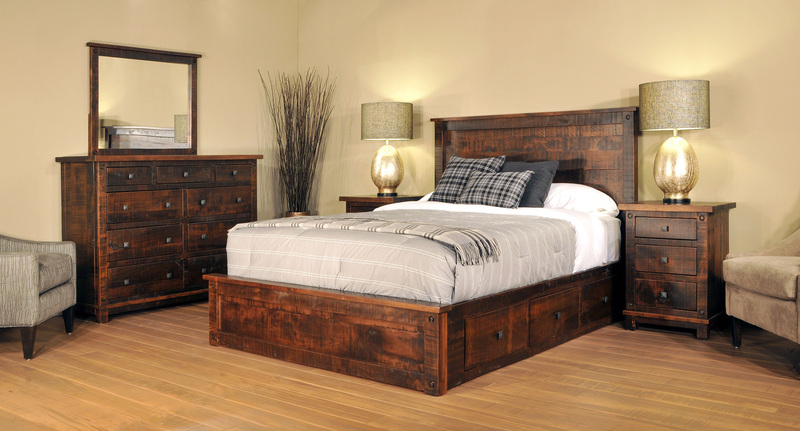 Queen 6 piece set includes: Queen Bed, Dresser, Mirror, Chest, & 1 Night Stand. Made to Order and shipped in standard Michael's Cherry Low Sheen #10. All drawers are full-extension glides. Diamond shaped drawer pulls come standard as shown on each piece. Queen- HB- 66" W x 54" H / FB- 66" W x 22.5" H / Total length 87"